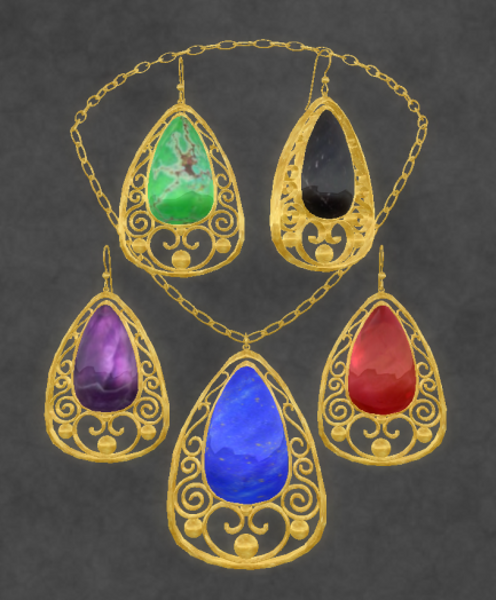 Just released at ELEMENTAL JEWELRY--the ROYAL ELEGANCE NECKLACE & EARRING SET! This ornate, regal design is perfect for formal occasions or role-play. It is available in both gold and silver, and each set has texture changing stones with 5 stone choices. The gold set has a choice of RUBY, ONYX, LAPIS LAZULI, AMETHYST, OR GREEN TURQUOISE. 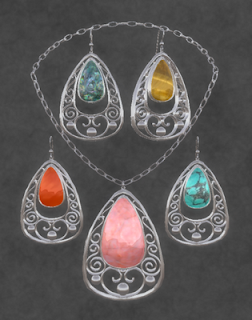 The silver set has a choice of ABALONE, TIGER EYE, CARNELIAN, ROSE QUARTZ, OR BLUE TURQUOISE. Sascha's Designs--5000+ Members Gown from Sasch's Designs @ Coco Beach Kelina. This was a free group gift last year. Sascha is very generous and gives a new gown to group members each month--thanks Sascha!